The Ngorongoro Crater in Tanzania is the largest unfilled inactive volcanic crater, or caldera, in the world. However, it’s not entirely empty as a wildlife spectacle unfolds in this dramatic setting. At the base of 610m cliff faces elephants trumpet, lions roar, and antelope…eat grass. 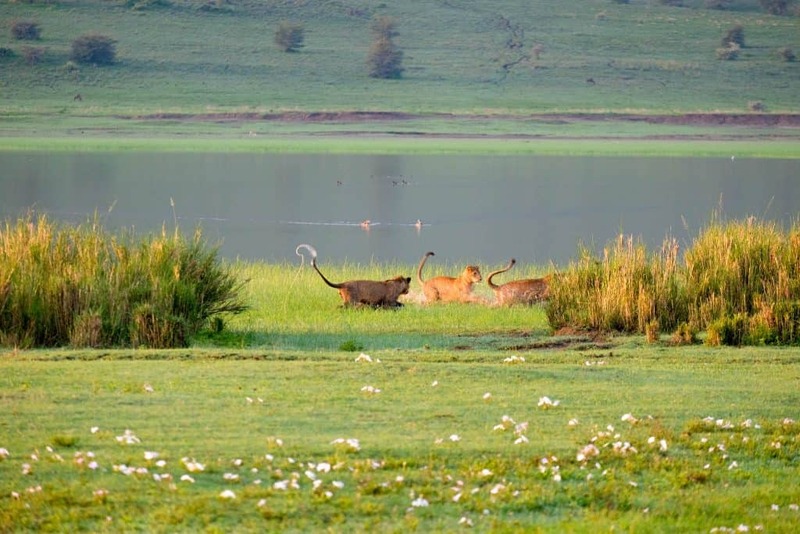 The crater is arguably the best place in Tanzania to see the big five. It is also a UNESCO World Heritage Site and one of the most mesmerizing natural features in the world. Humanity has deep ties to the crater as well. The Ngorongoro Conservation area is home to footprints that date back the oldest humanoids walking upright, nearly 3.7 million years ago. The age combined with other finds suggests that Northern Tanzania and the Ngorongoro Conservation area is the birthplace of humankind. One’s first descent into the crater is filled with a sense of our primordial origin. In the early morning, a fine mist rolls over plains filled with wildlife. To watch the sunrise from within the Crater it is one of life greatest experiences. There is no arguing that the crater is one of the most stunning natural features in Africa, a continent well known for its natural beauty. There is no cheap way to visit the crater as park fees are $78 a person per day and just the vehicle permit comes in at $297. We never told anyone Africa was cheap. Despite the high price, we found the crater to be one of those African experiences you simply cannot miss. It ranks right up there with gorilla trekking in Uganda, or going deep into the Okavango Delta in Botswana. All park fees in Tanzania are now payable at the gate via credit/debit card. They have done away with cash payments and you should be prepared to pay in advance or via credit card. Your tour company will usually handle all of permits/fees while you sit in the car or take photos! 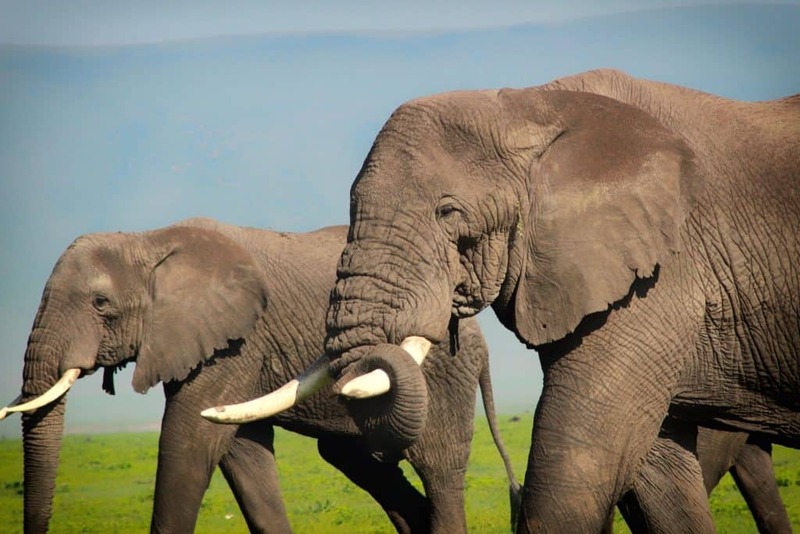 For a detailed breakdown of park fees in Tanzania, we found this pdf with current prices. It pays to have a solid guide when going on safari. We had a great guide set up by Perfect Africa, with African Horizons. Francis was our man for two days and his knowledge of the Tanzanian parks was abundant. We haven’t been with many guides more knowledgeable than Francis and he gave us tons of good pointers for the Ngorongoro Crater. The best advice he gave was telling us we should wake up at 5:30 so that we were the first ones into the Ngorongoro Crater before dawn. Which, meant that in the early morning hours we had the place to entirely to ourselves before the crowds descended upon the famous crater. I’ve never been the first one into a park or for that matter the only person in the park. This gave us the chance to experience the complete tranquility of the crater at sunrise. We are big time self-drivers and I have driven in almost every national park in Africa. However, we chose to go with a tour operator for the crater due to its extremely high vehicle permit fees and rough corrugated roads within the Serengeti and conservation. We felt the cost of self-driving the crater vs going with a safari company to not be a significant difference and having Francis drive and inform let me fully enjoy my experience instead of being the driver concentrating on the roads. We parked our vehicle safely with Ma and Bj at the Meserani Snake Park near Arusha and anxiously hopped on a safari to the see the Crater. The name Ngorongoro comes from the Maasai tribe. The translation is roughly “gift of life.” There is the Oldupai Gorge situated in the plains area of the conservation. Which is widely regarded as the most important prehistoric site in the world, with even the famous Mary and Louis Leakey having done research in the valley. The footprints and skeletal fragments have been instrumental in understanding early human evolution and development. The Ngorongoro Conservation, NCA, was formed in 1976. With its deep ties to humanity, cultural heritage is well prized in regards to the conservation. 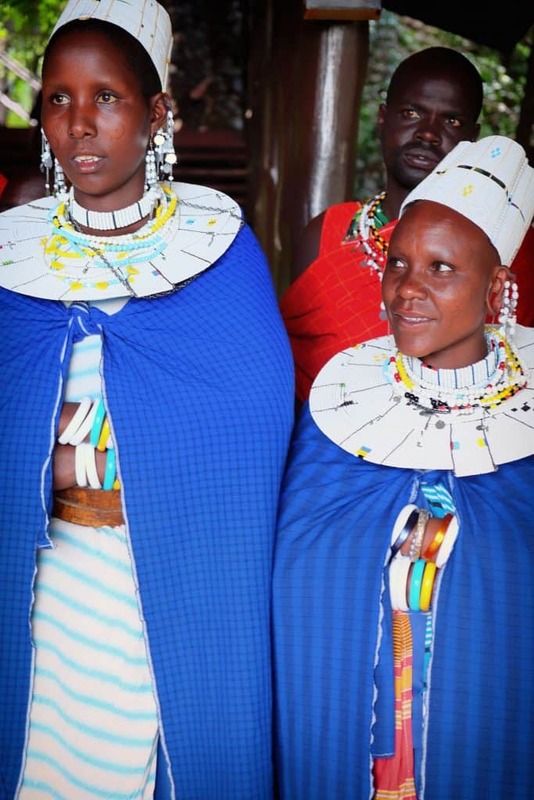 It is an area of land that has deep significance for both human and animal life and it is the only park in Tanzania where both human settlements, Maasai tribesmen, and animals live together. 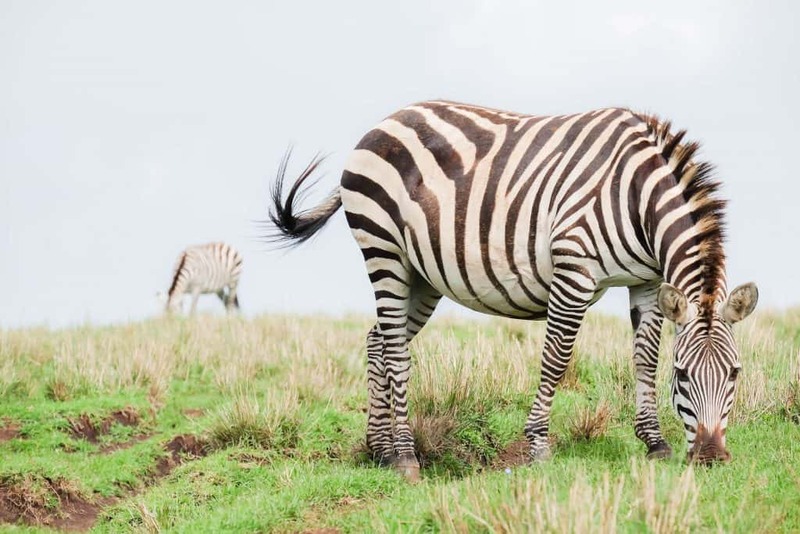 When driving around the crater rim guests will see pastoralist villages with the Zebra and buffalo walking through herds of cattle. 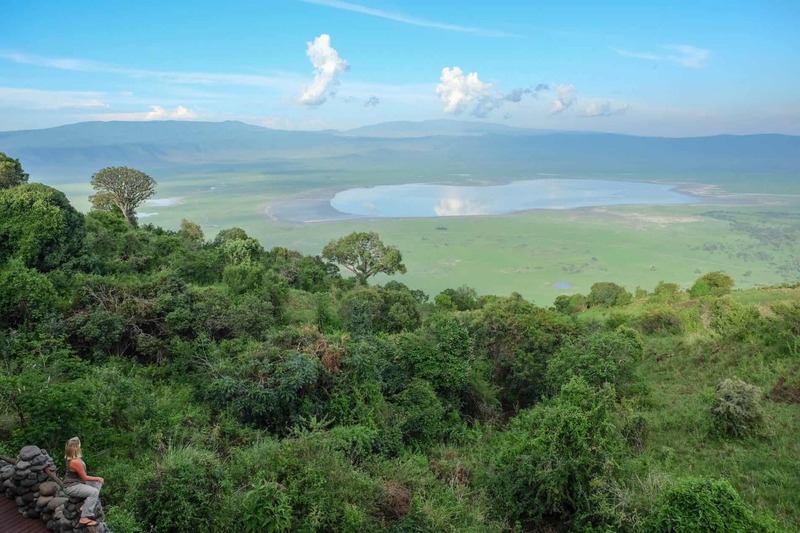 The Ngorongoro Conservation or crater is located in Tanzania. 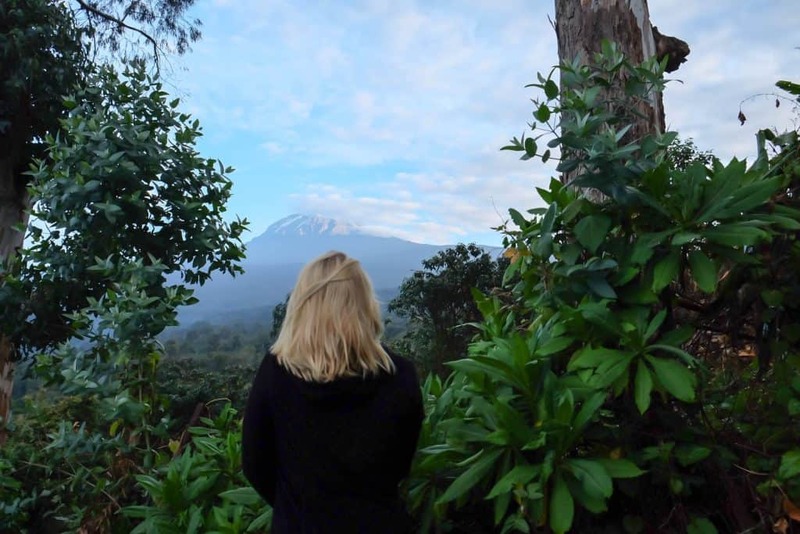 It is roughly 180km or 110 miles west of Arusha in Northern Tanzania. The crater is believed to have formed around 2.5 million years ago. After experiencing a large scale eruption the peak of the volcano collapsed and formed the crater. Estimates to the volcanoes original size put it at nearly 19,000 feet, or about the same size as Mount Kilimanjaro! The crater is 610 meters deep. While the floor covers an area of 260 square kilometers. It’s relatively small and can be seen easily in one day. The crater measures between 10-12 miles wide and the rim sits around 2250 meters in elevation. The Ngorongoro crater is home to roughly 30,000 animals, making it one of the most densely populated animal populations in the world. It is famed for its healthy black rhino population (of which we saw four total in one morning!). Many large animals call the crater home and you’ll likely spot many within a few hours drive. 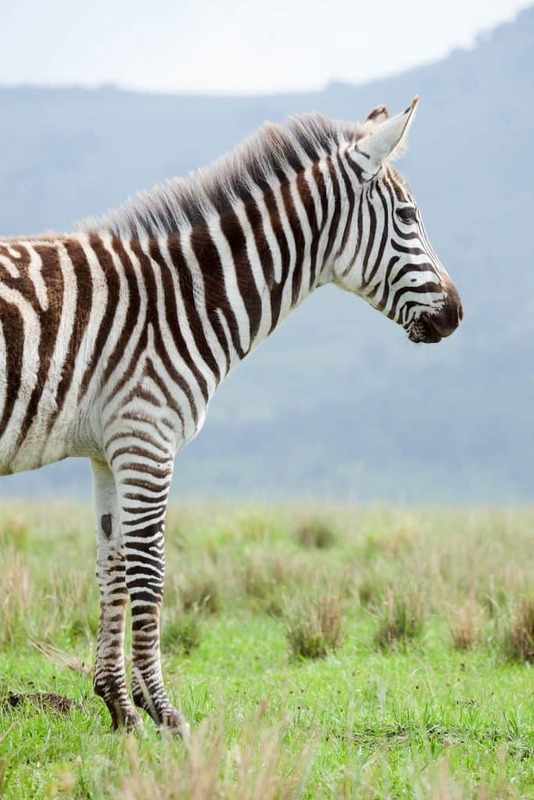 Large mammals include Grant’s zebra, Thomson’s gazelle, eland, hyena, elephants, cape buffalo, and lions. The majority of the craters landscape is a large grassy plain, so spotting wildlife is super easy. However, visitors should not expect to spot any leopards or giraffes, as there are few of the elusive leopard and no giraffe. I would recommend purchasing a good safari camera before your trip to Africa to take some amazing shots of the animals! Our first hour in the park we were fortunate enough to spot lion cubs playing in the water and two pairs of black rhino. Francis had arranged for our lodge to pack us breakfast. So, instead of a crowded dining room, we enjoyed our breakfast as the sun rose over the crater’s rim and struck a pair of black rhinos awakening for the day. It was of those rare moments in Africa that ignite our passion for this beautiful part of the world. There are only a handful of lodges that are on the craters rim and we were lucky enough to stay at one of them – the Ngorongoro Serena Safari Lodge. 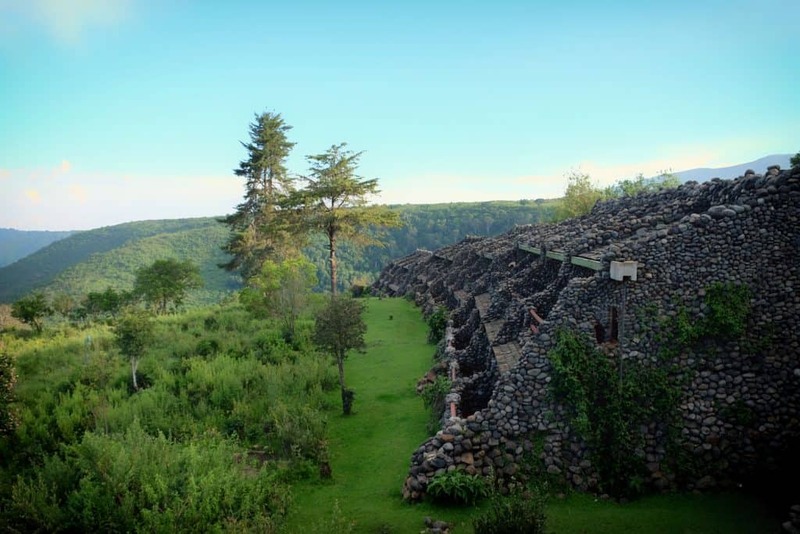 The stone hotel blended well into the crater’s edge while the atmosphere of the lodge was relaxing and intimate. We enjoyed the main lounge which featured communal fireplaces and great views of the crater with floor to ceiling windows. The focus of the property is obviously the crater. With numerous balconies around the property ensuring a serene spot to relax and enjoy afternoon tea or sundowners. Rooms in the Serena are small, but have balconies facing out to the crater floor. While the bathrooms and large closet space were more than adequate. I found the beds to be a little too firm for our liking though with rooms too tiny for three people. Dinner at the Serena Lodge was a wonderful affair in their large dining room, the waitstaff were attentive, and the fresh salads and curries were great fuel for a game drive filled morning. 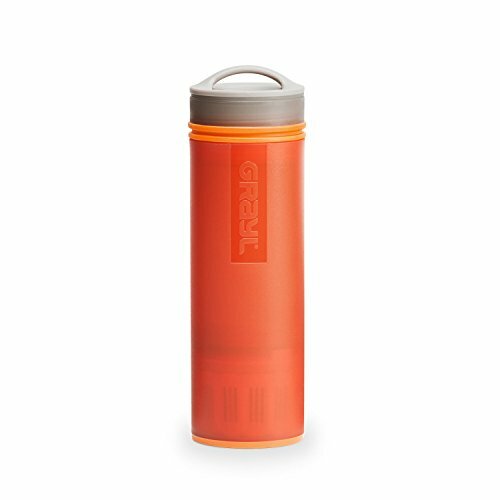 Overall, we found the total package of the lodge tough to beat. Rates start at $155pppn in the low season and go as high as $500 pppn for full board in the high season. It was our first time to the Ngorongoro Crater and although we were only there for one day, it felt like more than enough time to properly see the crater. The beauty beckons us to return. despite the fact that we have seen most of it. We find that our most enjoyable moments in Africa are times of reflection. 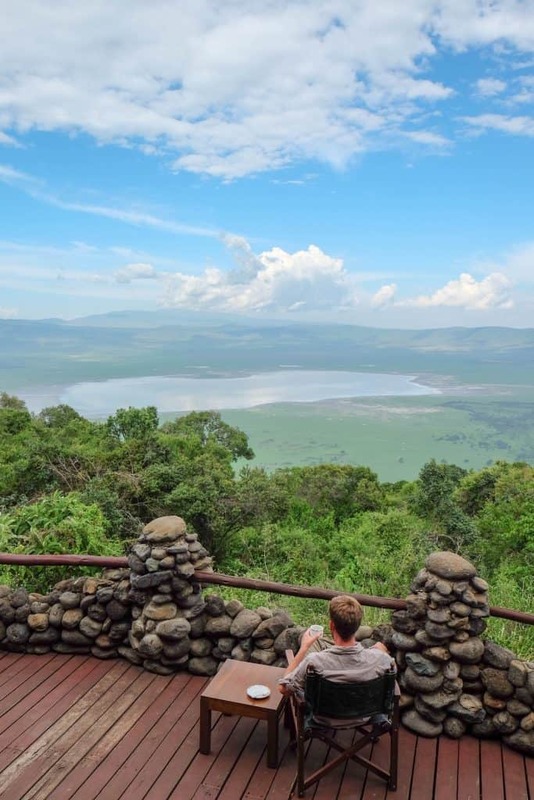 At the behest of our fantastic tour guide from African Horizons and tour company Perfect Africa we sat for several hours in the afternoon on the balcony taking in the serenity of the crater. It was a moment of reflection for me, while Tasha snapped photos of me drinking tea in a chair. The air at the crater’s edge feels mystical and the deep ties to humanity humbles visitors as they look on in awe.